After an absolutely huge set last year in the Danceteria, we’re welcoming back the untouchable Awesome Tapes From Africa for a free encore set in the front bar! It may be the first weekend of Sydney’s notorious lockout laws, but we’re ready to break on through with a party like no other as we team him up with Yo Grito! for an unmissable Friday night in the Small Club. 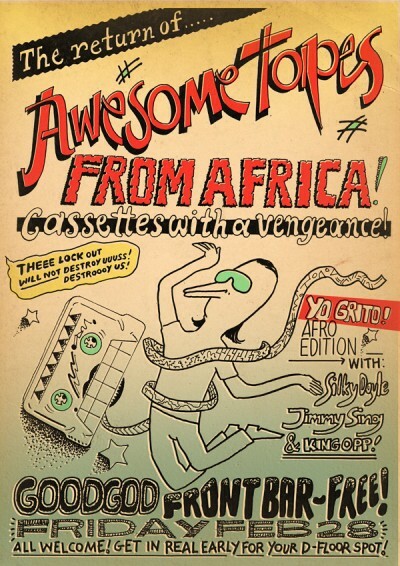 Awesome Tapes from Africa is the ongoing project of Brian Shimkovitz, a world-travelling musicologist who unearths, performs and re-releases stunning music from pop music cassettes in Africa. His previous set at Goodgod was an absolute game-changer, and we’re thrilled to have him back. He’ll be teaming with our weekly Friday night throwdown Yo Grito! for a night of shakin’ rhythms and unearthed gems, with Grito residents Silky Doyle and King Opp teaming up with Goodgod’s Jimmy Sing for a Front Bar frenzy like no other. Don’t forget! This is the first weekend of lockout, and we can’t let anyone in after 1:30am. Be early. Don’t try to get there right on 1:30. Come and settle into the cozy confines of our Front Bar nice n’ early, this is gonna be a special one.